The Boya can be found throughout Andhra Pradesh. However, they are found mainly in the Kurnool, Anantapur and Guntur districts. 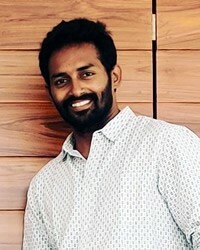 They speak Telugu and use Telugu script for writing. They are called 'Boya' in Andhra Pradesh, 'Boyar' in Tamil nadu and 'Bhovi' in Karnataka. Boya, Boyar, Boyi, Bhovi are the hereditary and clan titles. Boyar caste consists of many gotras. The Boya are considered one of the oldest castes and origin among many castes in India. The Boyars migrated from Indo-Iran around 5th century BC to Indian sub-continent and later 9th century to Turkey, Ireland and Romania. Boyars have Dravidian roots came from indus valley invaded south region. 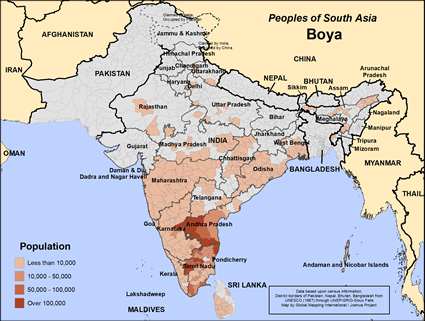 Boyars are mainly found in South India as Hindu Telugu speaking community and non-pure kshatriyas. The Boyar arrived in Andhra - Orissa region during Indo-Aryan migration around 5th century BC. Boyar warriors served as military regiment between 10th century to 15th century in Chalukya, Chola, Vijayanagar and Hoysala empires. The Musunuri Nayaks were Boyars and Kamma warrior chieftains in the Kakatiya army, who regained Andhra in 1326 from the Delhi Sultanate in the aftermath of the Kakatiya defeat. King Pratapa Rudras Kakatiya kingdom was served by seventy five chieftains called Nayaks. The Nayaks who belonged to various agrarian castes such as Boyar, Velama, Kamma, Reddy, Telaga, Balija, etc. were divided by mutual jealousy and rivalry but they are valiant cousins. Later in 17th century Boyars distinguished themselves as smiths, sculptors, nobles, leaders, priests, landlords, temple sculptors, arm traders and sea farers. Rice, ragi and jowar are their stable cereals. Agriculture is their main occupation. They also work as labourers on an annual wage basis. Child labour is prevalent. They live in nuclear families and follow patrilocal residence. Marriages are arranged by parents and dowry is a popular practice. A divorced man can remarry but a divorced woman is not allowed to remarry. Cross-cousin and maternal uncle-nice marriages have preference. The dead are buried. Only a small number of them are employed in government offices. They worship gods such as Malavobulesu, Chettu Devara and Mabbu Devara. On special occasions young boys perform a folk dance called Kilata or Kolanna. New clothes are offered during the Ugadi and Sankranti festivals as a form ancestor worship. They work as labourers who set up pandals and carry lights on festive occasion. The Boya are not supposed to accept food from the Sugali and Vaddi communities. * For the salvation of the Boya people. * For various developmental programs.View Boya in all countries.